Exposed pipes can freeze and burst, causing flooding and damage to your home. Pipes located in external walls and in unheated portions of your home are especially at risk. Carefully inspect each pipe for cracks. Keep an eye out for mold and moss, since they can be indicative of the presence of smaller cracks. If anything seems out of the ordinary, call a plumber immediately. Test your indoor faucets for water pressure. You’ll want to run each one with both hot and cold water to make sure they run as expected In addition to testing your indoor faucets, you’ll want to check any outdoor faucets for water leaks. If you didn’t properly prepare your outdoor faucet for winter, you run the risk of having burst pipes. Outdoor faucets are especially prone, since standing water between the shut-off valve and the faucet can freeze and expand, damaging whatever is in its way. If you turn on your faucet and water doesn’t begin to flow, don’t wait — this can mean the water has been redirected — often to the basement! Immediately shut off the faucet and find the source of the problem. Then get professional assistance to make any necessary repairs. The Cedar Rapids area is prone to flooding, especially as the snow melts and the soil becomes saturated with water. Test your sump pump to ensure it’s in working condition before you really need it. 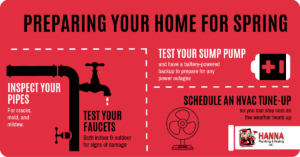 In the event of a power outage (especially during heavy storms), we recommend having a battery-powered backup sump pump to make sure your home stays dry, even when you don’t have power. 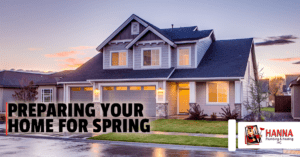 Each year as warmer weather hits, we recommend scheduling an HVAC tune-up. Neglected systems can harbor mold and bacteria growth, cause gas leaks, or cause any number of safety issues. Completing a safety inspection of your HVAC system can help ensure your system runs smoothly and efficiently before you need it most. By being proactive with home’s maintenance, you can save money over time and ensure a safer and healthier environment for your family. Want to schedule a plumbing repair, install a battery-powered back-up sump pump, or schedule an HVAC inspection? Contact us for more information.